Hello! My name is Michelle Rowan, and I’m happy to be here today to talk about my new store, Everything Charts – a place where you can purchase, instantly download, and save digital charts and games. It’s wonderful to be able to print them whenever you need them! I have created many charts that can help you stay organized with several daily tasks, planning holidays and parties, and having fun keeping track of special dates and milestones. I am also working on creating game printables to go along with each holiday of the year. What will you find at Everything Charts? Pregnancy countdown, pregnancy weight tracker, baby growth chart, baby tooth chart, baby milestones, baby immunizations, potty training chart, daily homework planner, boys and girls reading charts, master grocery list, packing list, weekly meal planner, job charts, birthday party planners, scripture reading charts, diet and exercise journal, New Year’s resolutions, Christmas gift planner, missionary countdown chart, pet responsibility chart, and several paper games such as word searches, bingo games, the dot game, hangman, and tic tac toe. I am also happy to create custom charts! To celebrate the ending of the school year, and know that many families are planning some vacation days -- today, we have a free printable for you! The Packing List! 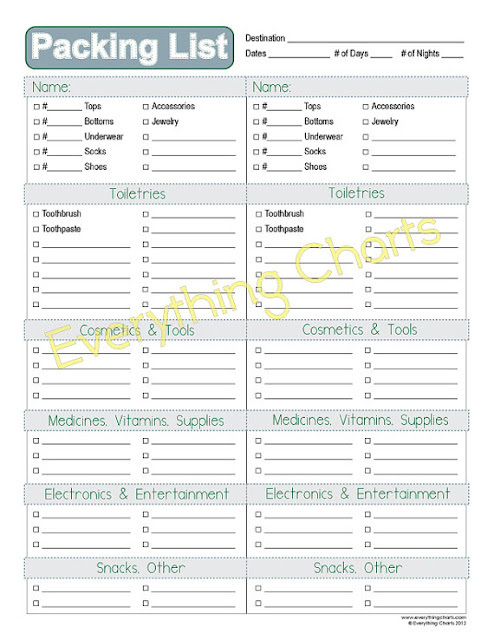 This printable will allow you to plan what to pack for two people per page – everything from clothing to medicines to snacks. I hope you will enjoy it! I will be continually creating new charts every week and offering freebies often. Please “like” Everything Charts on Facebook and sign up on the website to receive notifications of new products, special deals, and freebie announcements! I’d also love feedback and your ideas for new charts. I really need this. Thanks!